Please note each domain is sold separately. Pricing is subject to change at any time based on our discretion. Will sell for advertised price posted above. Contact Jason Gillespie in Greenville, SC for details about purchasing RobynFinley.com and or SeanBitner.com. Website and hosting plan is also available for purchase. Widgetized front page screen shot. Our web design and development empowers you to quickly and easily maintain your website. Add a new web page to website in minutes. Edit a website pages in real-time. Change fonts and colors and much more. 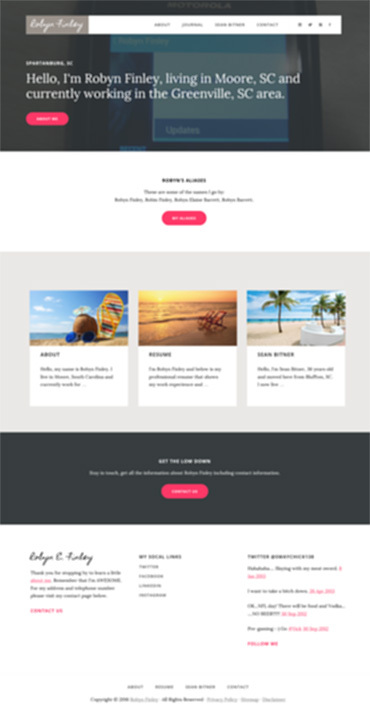 Whether you’re a novice or advanced web developer, this is the new design is for you. The only other thing you will need after purchasing your web domain name is a web hosting plan of your choice. Google web hosting plans. Call Jason Gillespie at (864) 881.1675 for any questions and availability. You can also message us via email through the contact form on this website. Once purchased (money received), we will transfer all domain names purchased to an account for you. Then you will need an existing web hosting plan or purchase a new one through us or someone else. Depending on if you already have a website or decided to purchase one of ours you will be up and running in no time. Thank you for stopping by look at the website and domains for sale. We can get your domain, web hosting and website setup in 30 minutes for less. The website template will only be sold to 1 person. So feel safe, there want be copies of your new website all over the internet. For around $1500.00 you can have a up and running website and domain. Stay in touch, get all the information about Robyn Finley including contact information. Thank you for stopping by to learn a little about me. Remember that I'm AWESOME. For my address and telephone number please visit my contact page below. Purchase a domain, hosting and website professionally designed.